While I normally post technical bits or project reports, occasionally we examine a historical event that happened "on this day" and see what is known about it. 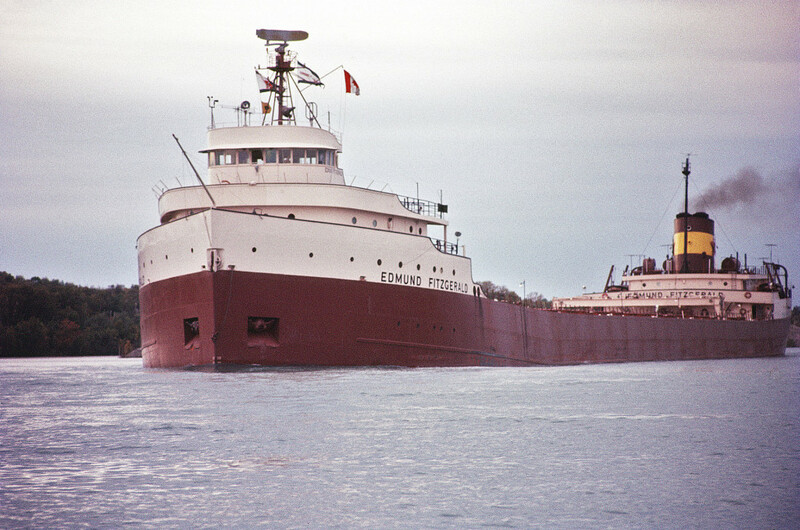 Today marks 40 years since the sinking of the freighter the SS Edmund Fitzgerald. The ship disappeared November 10, 1975 with no distress call in the middle of a severe storm on the great lakes. The prescribed route took her from Superior, Wisconsin, across lake Superior, and towards Detroit with a load of ore pellets. In this post I'll quickly give a synopsis of the storm and conditions of the sinking. A lot of research, videos, articles, and more have bene done on this event, so rather than re-write it all, we'll give a sense of the general circumstances and conjecture some on the theories of what happened. After leaving port, the Fitz was joined by another freighter, the Arthur M. Anderson, that looks nearly identical. The ships were not far apart for much of their journey and were within about 10 miles of each other at the time of last contact. While 10 miles is rather close, it was a huge distance in the storm that was coming upon them. It was a classic winter gale that had been expected to track further south. Winds rose, snow blinded the pilots, and the waves continuously grew from a few feet to rouge wave events of about 35 feet. Storms like this have frequently claimed ships on the lake, with the Whitefish Point area (where the Fitz sank) containing over 240 ships. The lake alone has over 7,000 wrecks and 30,000 lives claimed. Winds and/or equipment problems rendered the radar on the Fitz inoperable about 4:10 PM. Captain McSorley slowed down to close the range with the Anderson to get radar guidance. Later in the evening, the captain reported that the waves were high enough that the ship was taking significant seas on deck. The ship had also developed a bad list (i.e. was leaning to one side). At 7:10 PM the Anderson called McSorley to ask how the ship was faring, he said "We are holding our own." Minutes later the Fitz disappeared from the Anderson's radar screen and was gone without a single distress signal. All 29 on board perished and none were recovered. This probably wound't be anything but "another shipwreck" to the general public if it hadn't been for the Canadian songwriter Gordon Lightfoot. After reading about the accident, he wrote a ballad that described what it might have been like to be on the boat. The song (below) hit number 2 on the charts in 1976 and immortalized the Fitz and her crew. The wreck was found shortly after the accident by using an aircraft mounted magnetometer. The finding was confirmed with a side-scan sonar and then with a robot submersible. The ship had a broken back, lying to two pieces on the lake bottom, about 530 feet down. The aft of the ship was upside down and about 170' from the forward section. The forward part of the wreck sits roughly upright. There are several theories about how the Fitz sank, but none can be confirmed. The obvious theory is that the waves were too much for the boat, but there are likely more complicating factors. A set of rogue waves about 35 feet in height had struck the Anderson and were headed in the direction of the Fitzgerald. It is possible that these waves, which had just buried the aft cabins of the Anderson, were too much for the listing Fitzgerald and that it was submerged to never resurface. Another popular theory was that the cargo hold had flooded. The coast guard favors this theory as evidence at the site suggests that not all of the hold hatch clamps were fastened. The holds gradually flooded until the ship could no longer recover from a wave strike. While this helps explain the list, it doesn't fit with the long safety record of the hatch closures used on the boat. The NTSB favored a theory that the hatch covers collapsed under a very large and heavy boarding sea, the holds instantly filled, and the boat sank. That would explain the sudden disappearance - I'd think that if a slow flood was occurring, an experienced captain (which McSorley was) would have sent a distress signal. Some have even proposed that loose debris in the water or from the ship itself caused significant damage to the topside. Yet another theory was that the ship had raked a reef earlier in the day since it's navigational aides were out. The puncture slowly let water in and eventually it was too much to stay afloat. This theory has been mostly ruled out by the lack of evidence on the exposed keel of the ship and by no marks on the reef (surveyed shortly after the wreck). The final theory is simple structural failure. The hull was a new design that was welded instead of riveted. Former crew members and boat keepers said that the ship was very "bendy" in heavy seas and that paint would even crack due to the large strains. This mechanical failure theory seems most likely to me. Repeated flexing and/or riding up on a set of large waves allowed the hull to fail and immediately plunge to the bottom. The hull was under excess strain due to water loading from topside damage. That water loading is what caused the list. While some say the proximity of the sections mean that it sank whole, I disagree. The ship was 729 feet long and sank in 503 feet of water! If it had plunged bow first, hit the bottom, then broke there should be more evidence on the bow that just isn't there. Think ships don't bend in heavy seas? Have a look at the video below of a cargo ship passageway. Note about 11 seconds in when the ship hits a 7-8 meter wave. That's much smaller that the rouge wave that may have hit the Fitz. If you'd like to know more about the accident and see some interviews with experts, have a look at the Discovery channel documentary below. 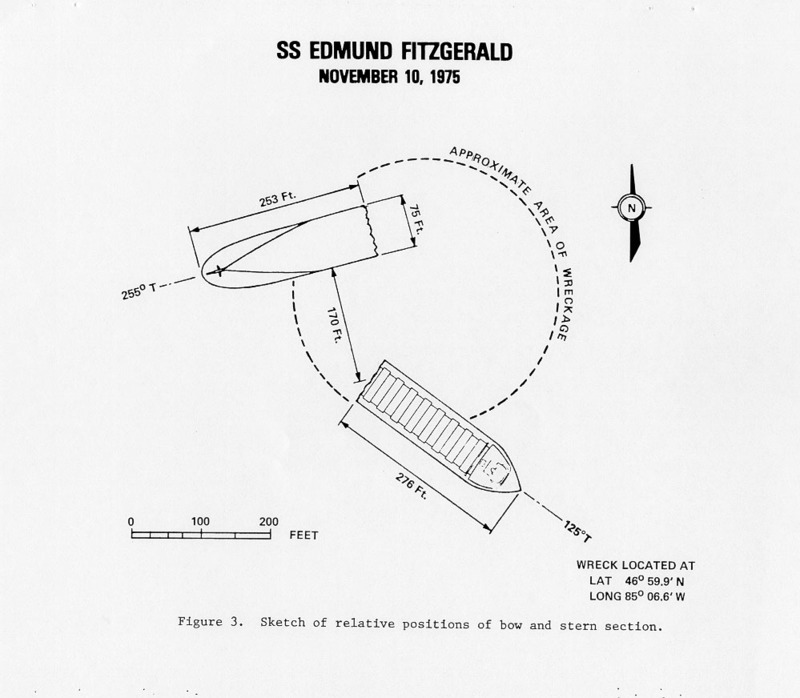 We will probably never know exactly how the Fitzgerald sank, but it's a very interesting and cautionary tale. It also reminds us of the incredible power of water and wind against practically anything that we can manufacture.